My OMG/UFO goal for May was to work on project number 11, drawn by Patchwork Times. My number 11 is a Hunter’s Star quilt. I wanted to get the backing sewn and the quilt top pin-basted. Done! I made the binding, too. I also wanted to get the top quilted. I stitched in the ditch to stabilize the quilt layers (but mostly to procrastinate while I thought about how to quilt this thing). Not done; but I have made good progress. I have a few more days left this month, so I will work on it as I can. Work hours increased, and I actually had some days of golden sunshine. I could not stay indoors! I also took time out to make luggage tags for an upcoming trip. I found a few more kaleidoscope stars that I haven’t pieced. All of the stars are cut from the same cloth (I wish I could tell you what company the fabric is from, or even what year, but I can’t. I don’t know). Looks like another UFO is born! Judy, at Patchwork Times, announced #11 as the UFO goal for May. This quilt was begun as an Inklingo project in 2013. You can see close-ups of the kaleidoscope stars in a blog post about this quilt here. My goal for May is to get this Hunter’s Star quilt top pin-basted and quilted. But first, I have to find it somewhere in the sewing studio. 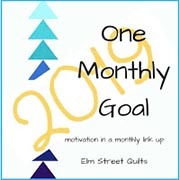 I am linking up with OMG at Elm Street Quilts and Patchwork Times. While there, I will see what others are up to for May.